Background: Fluid flow control techniques gained many advantages when, under the newly coined name fluidics, were found ways of operating without moving or deformed mechanical components. In particular, it became possible to handle fluid motion at very small scales and/or high frequencies. The control signals upon which this motion depends, are often produced by microelectronic devices, also operating without moving components. The transducers from electric to fluidic signals and actions, especially if the latter operate with air, however, cannot so far avoid two-stage indirect conversion, with intermediate mechanical motions of components which are difficult to manufacture, have limited life, and are slow due to mechanical parts inertia. Objective: Development of transducer for direct electric control of flow of air, circumventing the fact that air is electrically neutral and therefore not influenced by voltage or electric current and therefore not influenced by applied voltage or electric current. Methods: The solution is achieved by using ionic wind generated by non-thermal plasma discharge inside cavities the configuration of which correspond to a fluidic bistable diverter amplifier. By using the Coanda effect, the jet of air remains alternatively attached to one of the two attachment walls so that the ionic wind only briefly switches the jet between them. 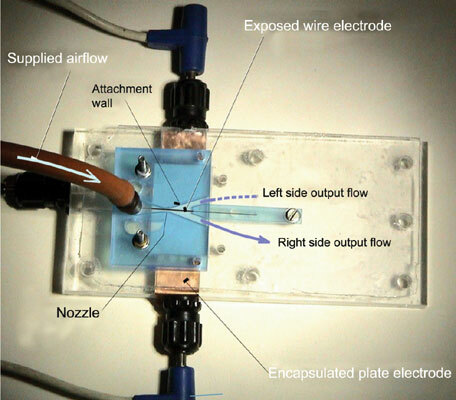 Results: Laboratory models of an electric-to-fluidic transducer were demonstrated to operate reliably with the input electric switching signal voltage increased in a transformer (inexpensive because mass produced for other purposes). The absence of inertia of mechanical components made it possible to operate at quite high switching frequency (above 100 Hz). Conclusion: Patent covering various alternative transducer configurations based on the ionic wind idea was recently grated to the present authors - unfortunately valid only within the boundaries of the Czech Republic. Keywords: Fluidics, plasma, ionic wind, dielectric barrier, fluidic amplifier, Coanda effect. Keywords:Fluidics, plasma, ionic wind, dielectric barrier, fluidic amplifier, Coanda effect. Abstract:Background: Fluid flow control techniques gained many advantages when, under the newly coined name fluidics, were found ways of operating without moving or deformed mechanical components. In particular, it became possible to handle fluid motion at very small scales and/or high frequencies. The control signals upon which this motion depends, are often produced by microelectronic devices, also operating without moving components. The transducers from electric to fluidic signals and actions, especially if the latter operate with air, however, cannot so far avoid two-stage indirect conversion, with intermediate mechanical motions of components which are difficult to manufacture, have limited life, and are slow due to mechanical parts inertia.